Vernon Carl Grounds was born and educated in New Jersey. A Phi Beta Kappa graduate, he received a BA from Rutgers University. His BD was granted by Faith Theological Seminary and a PhD from Drew University. Wheaton College awarded him an honorary DD and Gordon College an LHD in recognition of his long service as a Christian educator and leader. For 10 years he pastored the Gospel Tabernacle in Paterson, New Jersey, during which time he taught at the American Seminary of the Bible, the Hawthorne Evening Bible School, and King’s College. From 1945 to 1951, he was dean and professor of theology at Baptist Bible Seminary in Johnson City New York. He joined Denver Conservative Baptist Seminary in 1951 as dean, becoming president five years later. Retiring from that position in 1979, he continued to teach at the Seminary in areas of ethics and counseling and is now the Cauwels Professor Emeritus of Pastoral Care and Christian Ethics. In January 1993, he was officially named chancellor of the Seminary. For many years he also carried on a ministry at the Grounds Counseling Center. Dr. Grounds traveled extensively, preaching in hundreds of churches and lecturing at colleges, universities, and seminaries all across the country as well as Europe and Latin America. Coauthor of Is God Dead? Dr. Grounds also contributed to a number of symposia and encyclopedias. 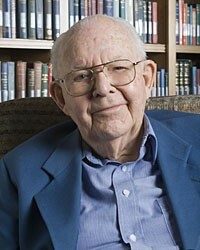 His articles appeared frequently in Christian periodicals and he regularly wrote devotionals in Our Daily Bread. On Sunday, October 11, 2010, Dr. Vernon Grounds whose name the Grounds Institute gratefully and proudly bears departed this life and transitioned into the presence of his loving Lord. Having been blessed with long life which he faithfully devoted to the service of Christ, Dr. Grounds impacted countless lives both in this country and across the world. The extraordinary influence he had on so many during his earthly sojourn was evident from the floods of spontaneous tributes that keep pouring in since the news of his home-going broke out. Some spoke with delight of the sharpness of his intellect, his quick wit, and consummate articulation. Others highlighted the humility with which he handled this great gift from God. They testified to his keen awareness of the scriptural caution that knowledge can puff up, but love builds (1 Cor. 8:2); hence his concern to use his giftedness with great care. He was careful for instance not to use his brilliance at the expense of others; nor did he allow it to keep him from rubbing shoulders with those who were not so endowed. Vividly present in the minds of others was Dr.Grounds’ compassionate spirit and deep concern for the welfare of others, be they students, fellow colleagues, distant acquaintances, and even critics. For others, it was his magnanimity and self effacing attitude that emerged to the surface. Despite his impressive achievements, incredible giftedness, and high profile as a leader of national and international stature, Vernon never basked in his self importance. Rather than focusing on himself, his tendency was to turn the spotlight on whoever his partner in conversation happened to be. In keeping with the Pauline admonition, he sought to exhibit Christ-like humility by endeavoring to “consider others better than [himself]” (Phil. 2:4). Yet for others, it was Vernon’s winsomeness that came to the surface. By temperament, he was irenic and non confrontational, even when holding firm convictions. This saying may be a cliché, but it characterizes well Vernon’s posture: to disagree without being disagreeable. For him, holding firm to one’s convictions needn’t result in the alienation of the opponent, let alone his or her demonization. He understood that the circle of divine love was wide enough to accommodate all contenders. And when conducted in the agapeic sphere and with the agapeic spirit, no dialogue, however passionate and animated, need degenerate into an adversarial duel. One of Dr Grounds’ long time colleagues comments that for him “the only thing that counte[d] was faith expressing itself through love” (Gal. 5:6). At the Grounds Institute of Public Ethics, we feel humbled, privileged, and honored to perpetuate Vernon’s legacy of vigorous Christian engagement in the market place for the sake of God’s name and the promotion of the common good.